Flickennel - Colorado Dachshunds with ALTITUDE! At Flickennel Dachshunds, we have known for a long, long time that our little friends make wonderful service dogs because they bond and relate so well to their owners that they seem to understand us better than we understand ourselves. 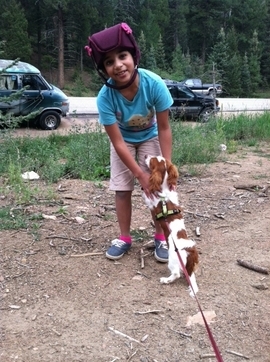 In 2012 we placed one of our older pups with a little girl who suffers as many as a hundred or more seizures ​​​​a day, and who has to wear a protective helmet at all times to protect her from head injuries during those seizures. 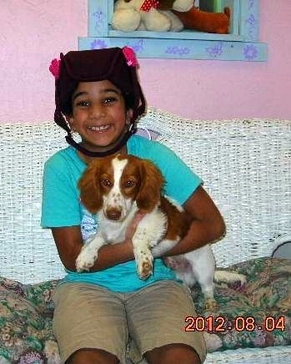 She needed a dog that would alert her to the onset of each seizure so she could be prepared for it. Her parents contacted us with their request, and we matched them with a pup who bonded instantly with their daughter. It seemed as if he had been born just for her, and they've been constant companions ever since. In May 2015 we were contacted by a ​​hearing-impaired woman who needed a new 'hearing dog' to alert her when the phone or doorbell rang, or some other sound was made that she needed to know about. She chose one of our puppies, and when they met it was again as if that pup had been specially born just for her - the "click" when they met was almost audible, even for Jo with her impairment! Little did we realize in the beginning just who Jo was, but we soon learned, and we are deeply honored to share with you her letter of endorsement of us, our kennel and our happy little dachshunds. Dear readers, many of you already know that I am happiest when I can endorse a business started and run by people with disabilities. I am writing to inform anyone looking for the best possible breed for a hearing, mobility, or therapy dog to consider the following information and my personal endorsement. I am a person who is deaf and must have hearing dogs. I have spent a lifetime trying to find the best breed of puppy to train as my hearing dog. In all these many years, I have never found a breeder who fully understood the requirements necessary or additional steps the breeder would also need to take, to have a puppy ready for me to take over for individualized training, until now! eyebrows alone will showcase a reaction to a car driving by, or the mailman, or the paper boy, and so many other things. It is so easy to utilize a puppy that I guarantee you will fall in love with, and the dog will train you in the areas you need help in. I find they are quite amazing! A lot of my friends have dachshunds now for most of the same reasons that I do and have fallen in love with their puppies too!! The great majority of hearing dogs are Sheltie-sized or smaller. In addition to their easily-accommodated size, the personality and temperament are vitally important for hearing dogs. They must be alert and energetic, ready to respond in an instant when a sound occurs, yet not hyperactive, as many small dogs are. They must be friendly and people-oriented: not overly protective to the point of barking or growling at strangers, but trusting and self-confident - neither domineering nor submissively cringing. Another important consideration in choosing a service dog is that breeds such as the smooth-coated dachshund require only minimal grooming, whereas longer- coated dogs demand more painstaking care that can be a burden to owners already dealing with personal disabilities. Going back to the dog's temperament, I quote Janet again: "Life is too short to put up with a dog with a mean disposition, which is why I won't breed dogs that have obnoxious temperaments. Over the years I have weeded out the bad-tempered dogs and it has paid off. Now I hear from customers how sweet their pups are, and as adults how calm and smart they have become. My veterinarian once said that when she dies shewants to be reincarnated (if there is such a thing) as one of my dogs.” We all know the sign for "heart words!" Whether you need a dog to cuddle and hold, or a hearing or mobility dog…. I urge you to contact Janet Flick for her help and recommendations. Janet is a great supporter of America's military veterans. Her father served in the Marines during World War II, was discharged and went home for a while, then re-enlisted in the Air Force, from which he eventually retired as a major. Her Army husband fought in Vietnam, and their younger son served in the Navy during Operation Desert Storm. After devoting many hours a day to her kennel operations, Janet then pours herself into crafting quilts for the wounded warriors (and sometimes their spouses) who graduate from various programs at Dave Roever's Eagles Summit Ranch, just a couple of miles from Janet's kennel, northeast of Westcliffe, Colorado. A recent session was for a group of “American Gold Star Mothers,” women who have lost a son or daughter in military service, and the quilts they received each featured a “gold star” appliqued to it. These special gifts mean an awful lot to each recipient, assuring them that someone really does care about them. In representing veterans with disabilities, I applaud her dedication to this outstanding labor of love. She also places many of her puppies in the hearts and homes of both veterans and active-duty military personnel and their families. Many other breeders won't. Now, please allow me to provide the history that hopefully speaks to my character and knowledge in requesting you and your network's collective support and consideration of Janet Flick and Flickennel Miniature Dachshunds. In 1987, I had the incredible honor of being selected by President Ronald Reagan to receive “The President’s Trophy,” America’s highest civilian honor bestowed by the President of the United States. I was asked to serve a lifetime appointment as the Disabled American for the Nation and represent all Americans with disabilities as America’s advocate. This speaks to advocating inclusion rights and working toward the ideal that people with disabilities have a right to participate to the widest possible extent in the mainstream of all facets of everyday living. I operate from a platform of honor. I believe strongly that if you do not have honor, you have nothing. numerous federal offices since 1987. Since 1987 I have worked closely with Administration Officials, Cabinet Members, the U.S. Senate and Congress, as well as numerous other elected and presidentially appointed officials, including the Chairman and Commissioners of the Federal Communications Commission (FCC), the U.S. Department of Defense and the Pentagon, the Secretary of Defense, the Secretaries of the Air Force, Army and Navy, the U.S. Department of Labor, the Federal Labor Agencies, and the Veteran’s Administration. Eleven years as a civilian force in the creation of the Americans with Disabilities Act (ADA), the Civil Rights Act of 1991 and Section 255 of the Telecommunications Act of 1996. I also prepared a benchmark request for President George W. Bush in regards to signing the Americans with Disabilities Amendment Act of 2009. I served on AMI/NASA’s Space Shuttle Design Team and served as the Chairman’s Appointee and a Primary Speaker for the President’s Committee on the Employment of People with Disabilities, which merged into the U.S. Department of Labor, Office of Disability Policy. I have organized numerous job fairs, which have placed more than 6,000 people with disabilities in the workforce. I have helped develop worldwide hearing accessibility standards for the telecommunications industry and have worked closely with the FCC on the HAC (Hearing Aid Compatible) Act and Section 255 of the Telecom Act, along with America’s private sector. Since my appointment as Disabled American, I have given over 1800 public speaking engagements nationwide. Hopefully one can see that I am a credible person and I speak from my heart. I strongly urge you and your network to visit www.flickennel.com or email Janet at flickennel@hotmail.com, for the perfect little puppy to serve as a new family member and just maybe the best service or therapy dog you'll ever have!! 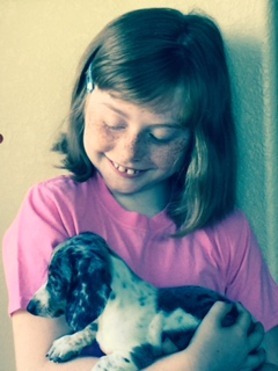 My granddaughter, Ellie, with my new hearing dog, Mater, who came from Janet Flick, owner of Flickennel Dachshunds, Westcliffe, Colorado. At Flickennel, we have placed other dachshunds with veterans afflicted with PTSD, and two retired females went to a woman who suffers from epileptic seizures. If you have adopted one of our dogs and had a similar experience, we would love to hear from you! Please email us a little write-up we can post here, along with pictures of you and your Flickennel Dachshund! Thank you! Facebook is such a neat place to find new friends, and of course lots of funny pictures. I was checking out a page called It's a Dachshund Thing, and flipping through their picture gallery, when I came across one featuring service dachshunds who alert their owners to various problems - oncoming asthma attacks, heart attacks, strokes, seizures, etc. They're not all trained to be service dogs, but instead have learned the little signs that point to trouble for their owners, and have figured out how to let someone know about it. Check it out - it really IS a Dachshund Thing! This is Sven, whose owner has epilepsy, and he alerts her when she's about to have a seizure. Does your dachshund have a SERVICE DOG harness like Sven's? Please let us see him or her - email us a picture and a little item we can put on this page! If your dog has been trained to be your service animal, I found a Facebook page for Servicedogkits.com that explains how to get your dog legally certified and registered, obtain harnesses, ID cards, and everything else you will need.